Nuclear power plants usually operate in base load mode, but might enhance value by flexible operation. In September 2015, I participated in a brainstorming session at the U.S. Nuclear Energy Institute (NEI). The main topic of this session (and two earlier sessions) was how U.S. merchant nuclear power plants could operate more flexibly in the face of market challenges and a changing electricity industry structure. Some of the ideas discussed in the NEI brainstorming session are covered in this Commentary. NECG Commentary #3 explained that economics drives most nuclear power plants to operate in base load mode. While base load operation is optimal in most electricity systems and markets, flexible nuclear power plant operation may enhance value in some electricity systems or markets. This Commentary discusses short term and long term flexible nuclear power plant operation. Short-term nuclear operating flexibility may allow a nuclear power plant to operate more profitably in response to short-term negative market prices. A negative spot market price is an economic signal that generators should reduce output. Some generators may have short-run marginal costs (and bids into the electricity market) that are negative. For example, a wind generator may receive tax or renewable credits that are linked to actual project output. A rational market bidding strategy for this wind generator is a negative bid equal to the total tax and renewable credits. This wind generator will operate profitably if the electricity spot market price is greater than the project’s negative bid. Other generators, including hydroelectric generators and nuclear power plants, may have a short-run marginal cost of zero. These generators want to operate at all times and usually bid into the market as “price takers.” This bidding approach requires the market to take all power produced by the generator and pay the generator the prevailing spot market price for that power. The price-taker bidding approach is a way to ensure base load operation for a nuclear power plant in the new electricity market environment. So long as electricity market prices are greater than zero, a nuclear power plant bidding into the market as a price taker earns some net revenue in each trading period that can be applied to cover fixed costs. However, if spot prices turn negative, the price taker nuclear power bidding strategy results in payments to the market operator. These payments are real cash cost incurred to maintain nuclear base load operation that increase the nuclear power plant’s non-fuel operating costs. If a nuclear power plant could reduce output when facing negative spot market prices, this cost could be reduced or eliminated. The following examples of short-term nuclear operating flexibility may provide some ideas for existing nuclear power plants that face negative spot market prices. The Bruce CANDU nuclear units have the capability to lower electrical output while maintaining full reactor power. This is done by bypassing steam turbines and dumping steam to the condenser to lower the electrical output of the steam turbine generators. Each of the eight Bruce units has a rated capacity of about 760 MW and each unit can provide 300 MW of flexible nuclear operation. Bruce Power’s 2,400 MW of flexible nuclear output is used by the Ontario market operator to balance the Ontario system when there is low demand and high wind generation. The figure above shows flexible nuclear operation during 4 to 10 September 2013. 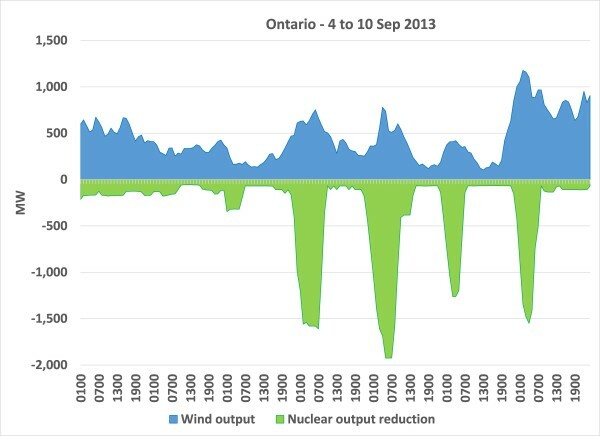 The Bruce flexible nuclear generation was used to balance Ontario system with a nuclear output reduction of about 2,000 MW in the early morning of Sunday 8 Sep 2013. The ramp rate (i.e., how fast can electrical output be increased or decreased) of a CANDU unit using steam bypass is up to 10% of full power per minute. This is greater than the ramp rate of CCGT units (i.e., about 5% of full power per minute) and better than the design ramp rate for the EPR and AP1000 advanced nuclear units (i.e., about 5% of full power per minute). In the NEI brainstorm session, nuclear industry participants noted that U.S. light water reactors have the technical capacity for steam bypass, but do not currently use this equipment for operating flexibility. If this steam bypass operating flexibility were used at U.S. nuclear plants, these plants might be able to reduce or eliminate payments to the market operator to remain at full operation during negative price periods. The benefit of flexible operation might be enough to keep a unit in operation that would have been retired early. In France, more than 75% of electricity is generated by nuclear power plants. The high level of nuclear power in France requires that some French nuclear power plants operate flexibly to respond to hourly, daily, and weekly variations in electricity demand. To provide this flexible operation, French nuclear power plants can operate in baseload mode, primary/secondary frequency control mode, or load following mode. Primary frequency control mode involves real-time output variation to maintain system frequency. Secondary frequency control mode is similar, with nuclear power plant output varied over longer periods to balance larger system demand and frequency variations. Load following mode involves a variable load programme with load changes at varying ramp rates for 24 hours. In load following mode, some units may operate as low as 50% of rated power. To implement these flexible operation modes, French nuclear plants use two types of control rods. Normal control rods are supplemented with grey rods that have a lower neutron capture effectiveness. Grey control rods and primary coolant temperature variation allows significant operating flexibility for French nuclear plants. Based on the experience in France and other European countries (e.g., Germany), European Utility Requirements (EUR) specifications call for new reactor designs to be capable of flexible operation that will allow both frequency control and load following. Some of the French flexible operation modes may be possible for U.S. nuclear power plants. Columbia Generating Station is a boiling water reactor located in the U.S. Pacific Northwest, where there is a large amount of hydroelectric power generation. Columbia performs power maneuvering in response to anticipated system demand/generation variations, a process that the plant operators refer to as load shaping. Columbia is the only commercial U.S. nuclear power plant that operates this way. Load shaping is required during the spring season to avoid excessive spillover at the hydroelectric plants in the Bonneville Power Authority (BPA) network. Increasing wind capacity in the BPA network may introduce new load-shaping requirements. Columbia performs load shaping according to guidelines negotiated with the BPA and approved by the U.S. NRC. Generally, operators adjust reactor recirculation flow to reduce power output to 85% of full power and adjust control rods to reduce power output to 65% power. Load shape power changes are performed in response to down-power requests from BPA. These requests must be received at least 12 hours prior to a reduction to 85% power, 48 hours prior to a reduction to 65% power and 72 hours prior to a full shutdown. A similar approach might be used by U.S. merchant nuclear plants to reduce power at night during seasons when negative prices are expected. There may be situations when long-term nuclear operating flexibility has value. A nuclear power plant may have operating costs higher than electricity market prices resulting in operating losses. These operating losses may be projected to continue for years. So far, two U.S. merchant nuclear power plants, Kewaunee and Vermont Yankee, retired early because of current and expected financial losses in electricity markets. Several other merchant nuclear projects are reported to be in a similar situation. Retire the unit and commence decommissioning. If a third option were available to put these nuclear power plants into a mothball state for a decade or more until market conditions improve, this might be a more attractive option than permanent early retirement. Canada provides another lesson on nuclear flexibility. In 1997, Units 1 to 4 at Pickering were mothballed. Pickering Unit 4 returned to service in 2003 and Unit 1 was returned to service in 2005. Pickering Units 2 and 3 remain in safe shutdown. In 1998, three of the four units at Bruce A (i.e., Bruce Units 1 to 4) were mothballed, with Bruce unit 2 mothballed in 1995 due to steam generator problems. In May 2001, Bruce Power LP (Bruce Power) became Canada’s first private nuclear generating company and the licensed operator of Bruce A and B through a long-term lease with Ontario Power Generation. At the time of the lease, the four Bruce A units were mothballed. After assuming responsibility for Bruce A, Bruce Power returned Bruce Units 3 and 4 to service in January 2004 and October 2003, respectively and returned Bruce Units 1 and 2 to service in early 2012. The Pickering and Bruce nuclear units might have been retired and decommissioned at the time they were placed into mothball mode, if the mothball option had not been available. The mothball option kept these units available for a later restart. An operating U.S. nuclear power plant has two options, either continue to hold an Operating license or retire the plant and move to a Possession-Only license. A nuclear power plant with an Operating license must continue to maintain operators and other staff. Staff costs are a major part of the nuclear power plant’s fixed costs, so simply shutting an operational nuclear power plant down and maintaining the Operating License would not significantly reduce fixed O&M costs, but might reduce fuel and refueling outage costs. When a nuclear power plant is retired and shifted to a Possession-Only license, this is a one-way path to decommissioning. Obtaining a new Operating License for a unit that has been retired might be possible, but would likely require the plant to comply with current NRC requirements (i.e., instead of the requirements in place when the original operating license was issued). Updating an older nuclear power plant to meet current requirements might be very expensive. Include requirements for the return of the unit to operation to allow the plant owner to assess the costs or restart prior to entering the Suspended Operating License mode. Having this new nuclear license option might allow threatened U.S. merchant nuclear plants to go into mothball status rather than retiring permanently. Short-term nuclear operating flexibility may be able to enhance the returns for existing nuclear power plants. Long-term flexibility to mothball nuclear power plants may allow uneconomic units to return to service years later when electricity market prices are higher. Scott Luft’s Cold Air blog (http://coldair.luftonline.net/); based on archived data from 201336 Weekly Report (i.e., for 4 to 10 September 2013).